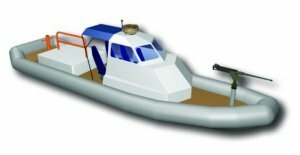 The 35-feet Long Range Interceptor (LRI) and the 25-feet Short Range Prosecutor (SRP) are the two new Rigid-Hull Inflatable small boats being introduced for the Deepwater cutters. 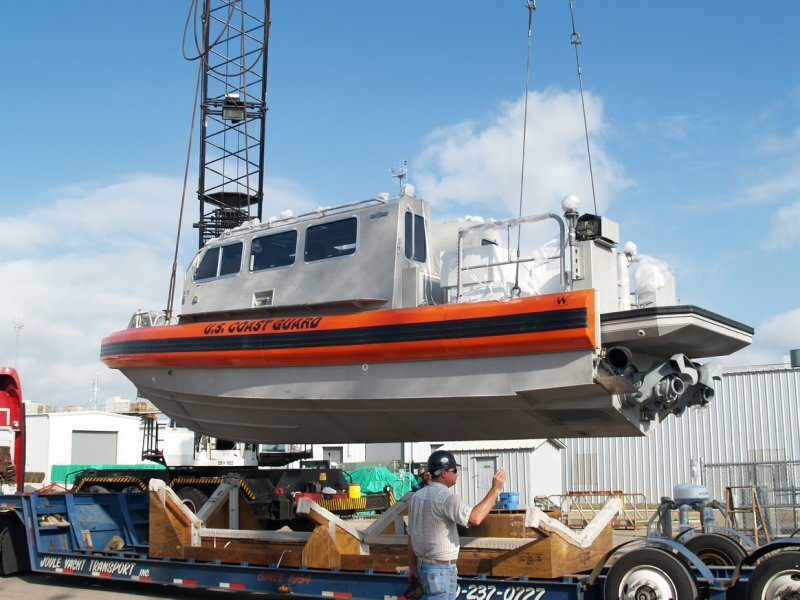 The modernized 123' Maritime Patrol Boat (WPB) and the Fast Response Cutter (FRC) will carry one SRP. The National Security Cutter (NSC) and Offshore Patrol Cutter (OPC) will be able to carry two boats in any combination. Integrated Coast Guard Systems (ICGS) awarded a subcontract to Willard Marine, Inc., of Anaheim, Calif., a contract to provide Integrated Deepwater System with the first in class Long Range Interceptor (LRI). The quantity of LRIs are planned to compose a smaller part of Deepwater's final strength in a trade off with the Short Range Prosecutor that maximizes the utility of these two small boat assets. 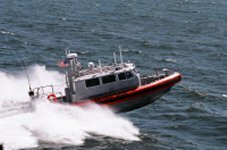 The LRI will now receive critical DHS and DoD C4ISR interoperability improvements including MILSATCOM, local responder-interoperable radio communications and integration into the National Distress Response Modernization Program, known as RESCUE 21, which will provide the port commanders with real-time tracking of the LRI and seamless data sharing, including the Automated Identification System (AIS). The LRI provides the ability for a cutter to deploy an armed boarding or counter-terrorism team over the horizon, up to 100NM from the cutter at speeds of 45kts or more. The enclosed cabin of the boat will provide crew protection for up to 10 hours thereby increasing operational presence and deterrence in security situations. The bow-mounted M242 machine gun provides visible deterrence and stopping power against maritime targets. 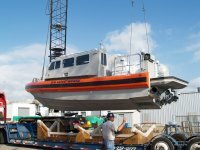 The LRI, built by Willard Marine in Anaheim, Calif., is one of two small boats that will be deployed with the National Security Cutter (NSC). It will allow a boarding party or search and rescue team from the NSC to operate independently over the horizon from the cutter for up to 10 hours. The cabin is fully climate-controlled and includes shock-mitigating seats to minimize crew fatigue on extended missions. Traveling at speeds up to 45 knots, the LRI is capable of intercepting most targets of interest or reaching the scene of an emergency much more quickly than the cutter itself. The LRI was designed around an existing 11 meter Rigid Hull Inflatable Boat (RHIB) customized to meet the unique mission requirements of the Coast Guard. Lockheed Martin is responsible for the C4ISR system aboard the LRI which integrates numerous navigation sensors, computer networks and communications equipment with long range connectivity providing the crew with unprecedented situational awareness. The navigation system has already passed the factory acceptance test with 100 percent stability and availability. By June 2007 construction of the Long Range Interceptor (LRI) was 95 percent complete and preliminary testing was underway at Willard Marine's facility in California. The LRI will allow a boarding team or search and rescue party from the National Security Cutter (NSC) or Offshore Patrol Cutter (OPC) to operate independently up to 80 miles away from the cutter for up to 10 hours. The cabin is fully climate-controlled and includes shock-mitigating seats to minimize crew fatigue on extended deployments. LRI design and construction work required an extraordinary level of cooperation among team members from the Coast Guard, ICGS, Northrop Grumman, Lockheed Martin and Willard Marine. Human systems integration work began early in the design process and has resulted in an exceptional level of crew comfort and functionality. This is a deployable small boat with facilities and communication, sensor and data processing capabilities which were previously unavailable on a vessel this size. Factory Acceptance Trails were scheduled to begin in July 2007 with delivery to Northrop Grumman Ship Systems in late summer 2007. The first LRI will then be integrated with USCGC Bertholf (WMSL 750) as a major component of the cutters mission equipment to be tested on sea trials and deployed with Bertholf after the ship is delivered in early 2008.